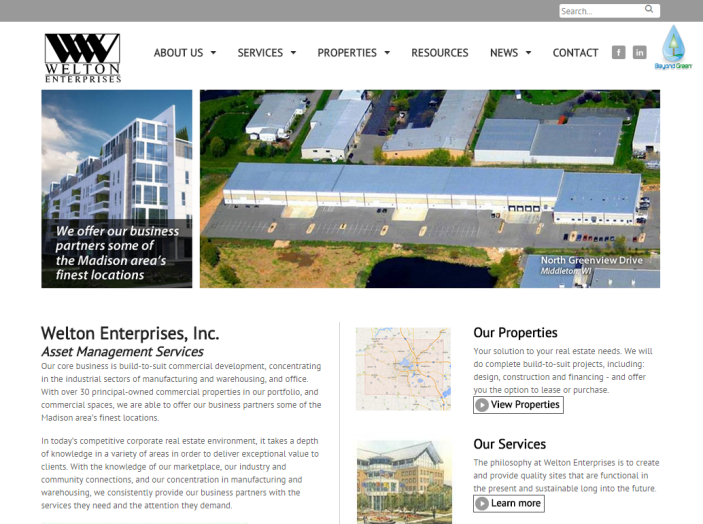 On August 21 Welton Enterprises, Inc. went live with an entirely new and updated website! Still at www.buildtosuit.com, they now have more information on their available properties as well as the entire Dane County Portfolio and a great new interactive map. Each property has its own feature page that includes ground and aerial photos and a Property Data Sheet with even more detail. One of the best new features of the site is the News section with newsletters from the past few years that include news and promotion of their tenants and business partners. Their new site is accessible on all mainstream browsers and mobile devices and will adjust to your viewing needs without compromising your experience. Easy navigation, generous amounts of photos and data as well as a historical “Journey” of our Silicon Prairie™ project make this new website not only fun, but a valuable “goldmine” of information for the curious or those doing due diligence.